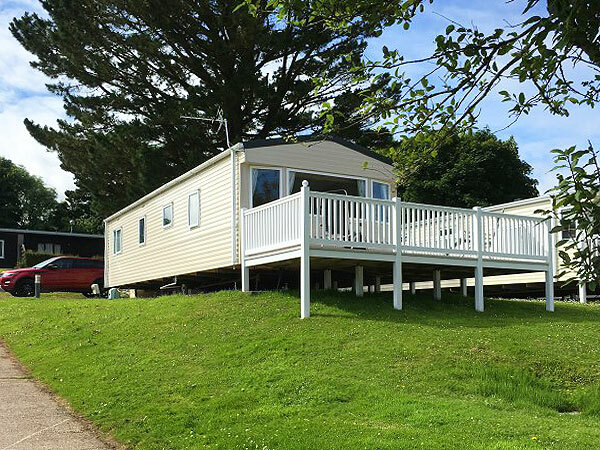 High above Bideford Bay, with views out over the sea, this spacious 2014 ABI Elegance Gold Graded holiday home is situated on a Premium Pitch, with Sea View and dedicated Parking Bay at Bideford Bay Holiday Park and is for hire for week and short breaks throughout the year. 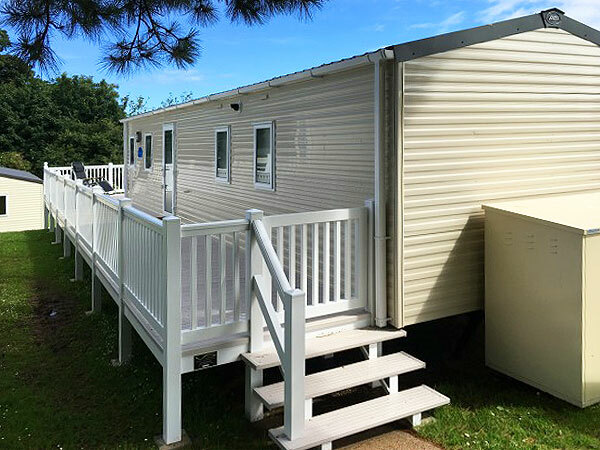 It boasts an 8ft x 18ft deck to the front, 6ft down the whole of the side and finished off with a lockable gate. 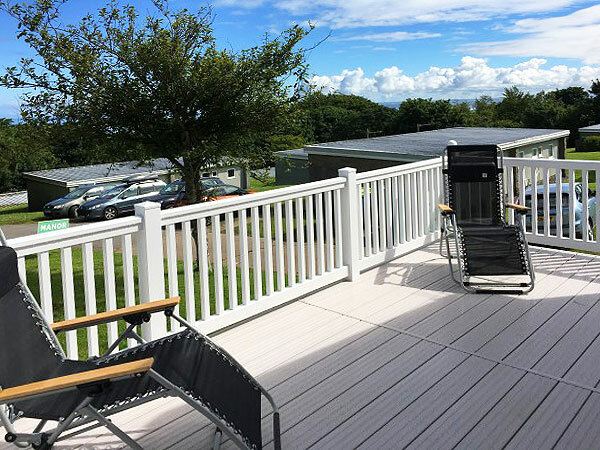 There is a "Cube" design patio set with table, parasol and seating for up to 8 to cater for the odd visitor or two you may have during your stay. 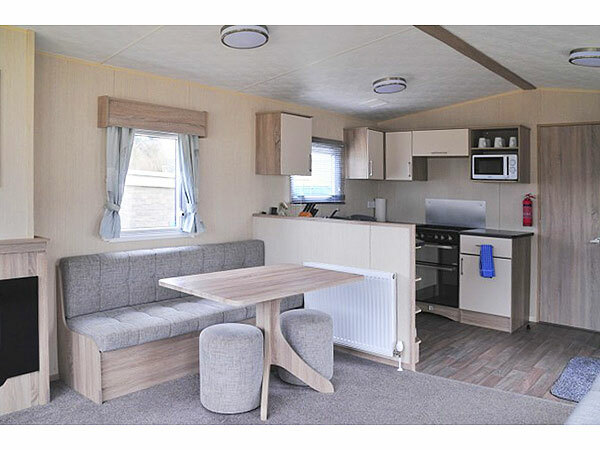 Inside, the home is laid out in an open-plan style with a spacious lounge-diner and a well equipped kitchen, with a gas cooker (oven and hop), microwave, toaster and a fridge/freezer. There is a Curved LED TV, with FreeSat PVR and DVD Player. 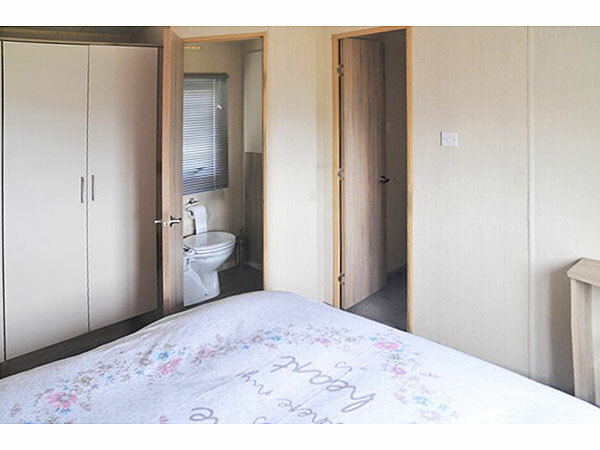 A door leads from the kitchen area into a short corridor, which takes you first on the right to the family shower room with wash basin and toilet; straight on to the main bedroom with kingsize bed, ample wardrobe space and an en-suite toilet with wash basin; and on the left the 2nd bedroom with 2 single beds, which can, if required, be reconfigured to form a double bed, and a small wardrobe. Bedding is included and consist of Mattress Covers, Bottom Sheets, Quilts with Quilt Covers, Bottom Sheets, Pillows, Pillow Covers and Cases. 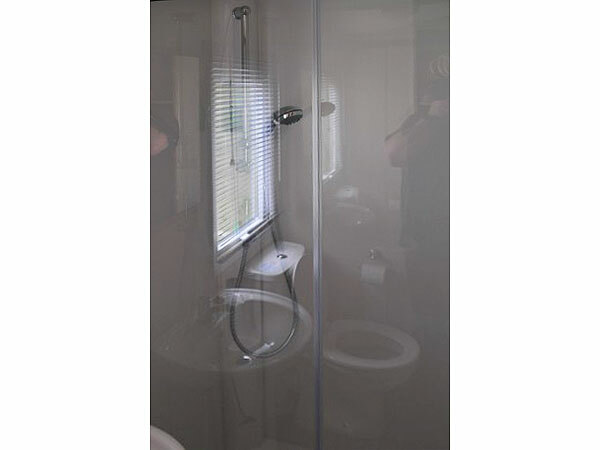 There is central heating and instant hot-water supplied via a gas combination boiler. There is also an electric fan heater integrated in the feature fire place in living room. The Premium Pitch benefits from its own dedicated parking bay too. There is additional parking to the rear and side, which is on a first come, first served basis. 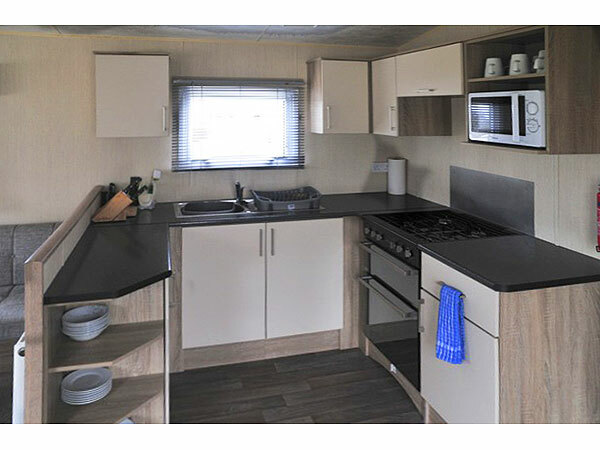 Notice - Whilst the holiday home is indicated as "no pets" this is not to imply that pets have never been allowed into, or stayed in the home within it's lifetime. Every effort is and has been made to ensure the home is cleaned and maintained to a very high standard, however, no guarantee can be given, nor responsibility taken or accepted, for anyone who chooses to use this facilty who suffers from "pet allergies" having had this information provided here in advance. 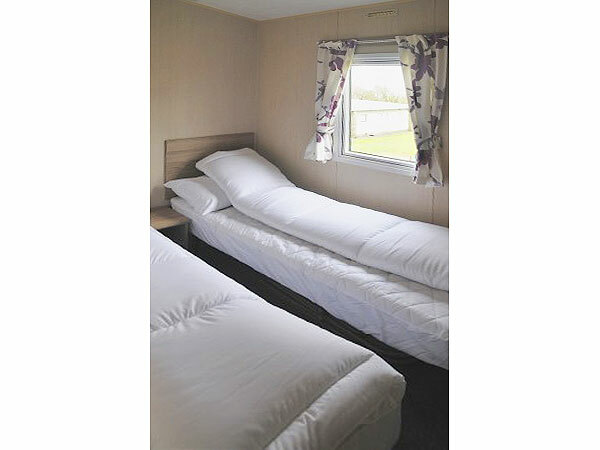 Weekly (7-nights) with access from 15.00 hours on the day of arrival until 10.00 hours the day of departure. This is normally on a Saturday to Saturday basis but alternatives considered. Short-Breaks - from 1-night, and up. 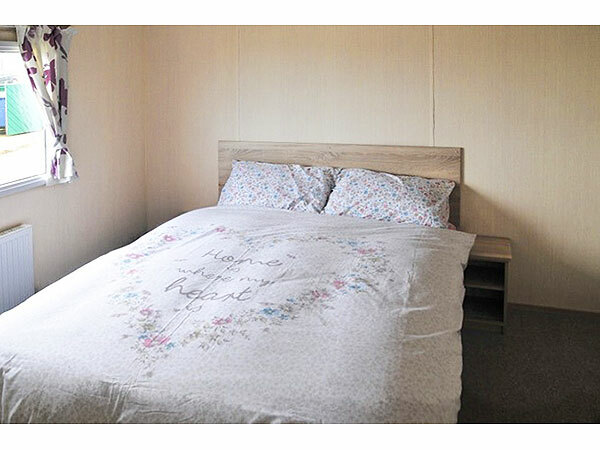 Longer (than 7-nights) bookings may be available, dependent on availability. 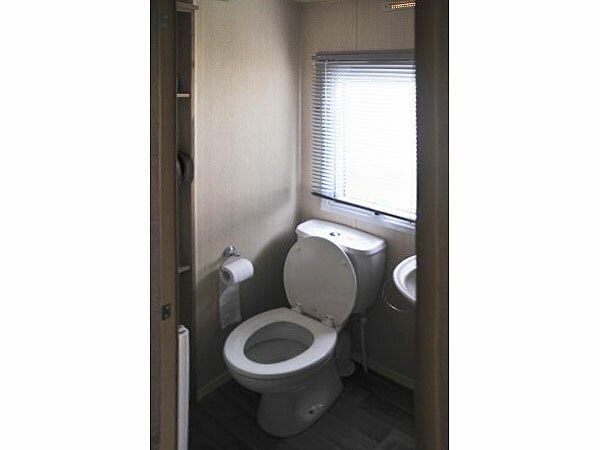 Please call or email with your requirements and we will aim to facilitate your requirement. 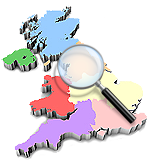 Security Deposit - A £75 damage/loss/cleanliness/key loss deposit is also required at the point of booking (refundable in full or in part dependent on whether there are any issues or not). Please Note. This is a No Smoking Holiday Home. In the event that there is evidence of smoking having taken place inside the home, then the full security deposit will be charged to pay for fumigation to take place. Further, we do not allow pets to accompany you. In the event that there is evidence of a pet having been taken in the home, then the full security deposit will be charegd to pay for additional cleaning and odour removal. Also, there is strictly "No B-B-Q'ing" within the confines of the pitch what so ever! Both deposit and security deposit must be paid within 3-calendar days of making a booking**, unless the booking is made within 6-weeks of the holiday commencing. Full payment is due 42-days (6-weeks) prior to commencement of your holiday. 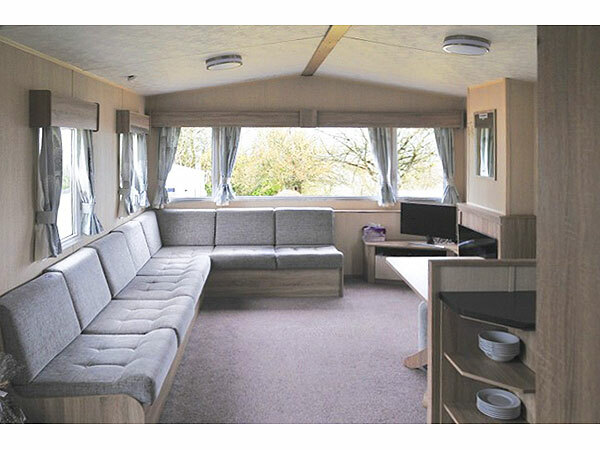 **Where a booking is made within 6-weeks of the holiday commencing, then the full amount, plus the £75 security deposit, is payable at the time the booking is made. Park Passes are not included in the price and are available for purchase from the site Main Office. Amount payable in the event that you need to cancel your booking. * A refund of up to 75% of the original booking cost can be applied, dependent on the holiday home being fully re-let during the period originally booked. Only electronic payments are accepted, through BACS Faster Bank Transfer. 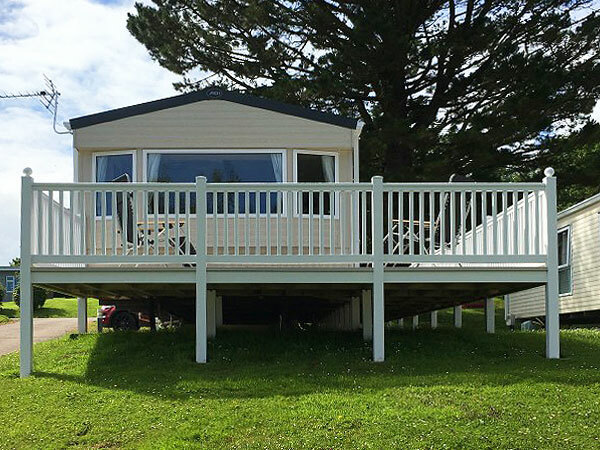 Bideford Bay Holiday Park in Devon is set in an amazing woodland location, with stunning sea views. It's also a short hop to picturesque Clovelly and the golden Blue Flag beach of Westward Ho! The heated outdoor pool (open 23rd May - 1st September) is perfect for basking in the sun whilst the kids shoot down the flume, or play a game of crazy golf.